Though it means saying goodbye to the beloved friends and spiritual mentors of her St. Charles, Missouri quilting circle, Anna Goben is certain that she needs to enlist her family in the Boones Lick Company wagon train. 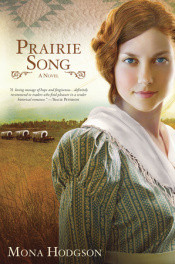 The loss of her beloved brother in the Civil War has paralyzed her mother and grandfather in a malaise of grief and depression and Anna is convinced that only a fresh start in the Promised Land of California can bring her family back to her. Although the unknown perils of the trail west loom, Anna’s commitment to caring for her loved ones leaves no room for fear—or even loving someone new.